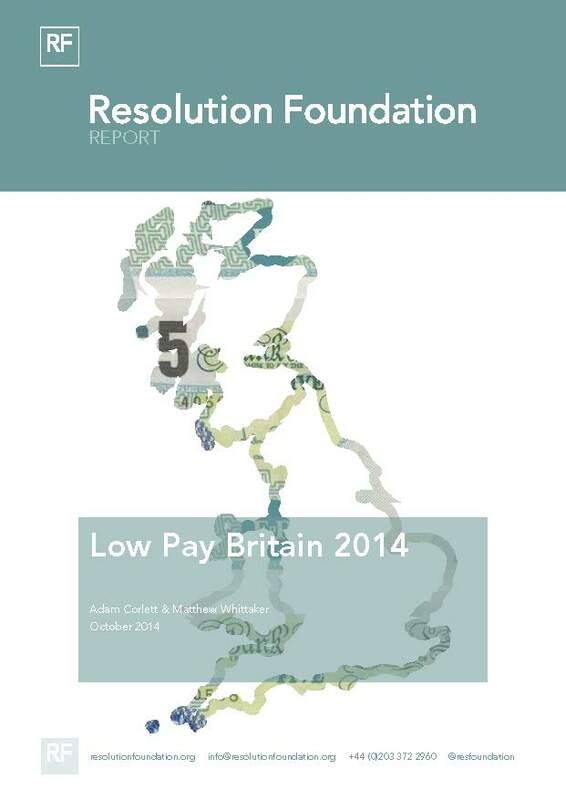 This report is our fourth annual audit of low pay in Britain. It describes in detail the scale of the problem in the latest year for which data is available (2013) and the people it affects. As with many advanced economies, the British labour market has been characterised in recent decades by a growing polarisation. Employment growth has been strongest at the top (high-skill, high-paying jobs) and the bottom (lower-skill, lower-paying jobs) with a decline in employment rates in the middle. It has therefore become consistent for economies to develop high-skill sectors and achieve strong economic growth, while at the same time maintaining sizeable rumps of low paid work. Since the first Low Pay Britain publication in 2011, the debate about pay has changed quickly and we can consider three distinct phases. First, in the five years or so before the financial crisis, workers across much of the earnings distribution found that real wages stagnated even as the economy continued to grow. Secondly, in the immediate post-crisis period, real wages fell, as nominal pay growth slowed and inflation rose above target. More recently, we appear to have entered a new phase in which nominal pay growth has slowed still further, meaning that real pay continues to fall even as inflation has dropped well below target. As economic recovery builds, the key question for the coming years is whether or not renewed jobs growth will feed through into pay growth that is shared across all workers. One-in-five employees (22 per cent, or just over five million individuals) in Britain earned less than the low-pay threshold in 2013. This is a slight – but statistically significant – increase (0.8 percentage points, or 250,000 people) on 2012, reversing a slight fall in the previous year. Extreme low pay affected just 2 per cent of employees – likely to be young people and apprentices – reflecting the fact that the threshold falls below the main adult NMW rate. One-in-five employees (20 per cent, or around 4.9 million individuals) earned less than a living wage. As with the relative low pay measure, this is a slight – and statistically significant – increase (0.5 percentage points, or 180,000 people) on 2012. One-in-three employees (32 per cent or around 7.7 million individuals) earned less than the reference living wage. Across each measure, those most at risk of low pay include female workers, the young, those in lower skilled occupations, part-time and temporary workers and those employed in hospitality, retail and care. Unlike the trend in overall low pay, the prevalence of those earning less than two-thirds of the median has continued to increase in recent years among younger workers, men, those employed in elementary and sales & customer services occupations and those working in hotels & restaurants and in retail. In contrast, it has been falling over recent years among older workers, women, those employed in higher skilled occupations and those working in the public and third sectors. There was, however, a slight increase in low pay in many of these groups in 2013.